Replacement for Atlas-Copco: Roto-Inject FLUID…etc. From the makers of NASYN Synthetic Lubricants comes a breakthrough in compressor lubricant technology. The NASYN S Series compressor lubricants are semi-synthetic compressor lubricants formulated from semi-synergistic & highly purified group III base fluids coupled with a unique, new, high performance additive package that gives the superior performance of synthetic oils. They are compatible with mineral and PAO oils. 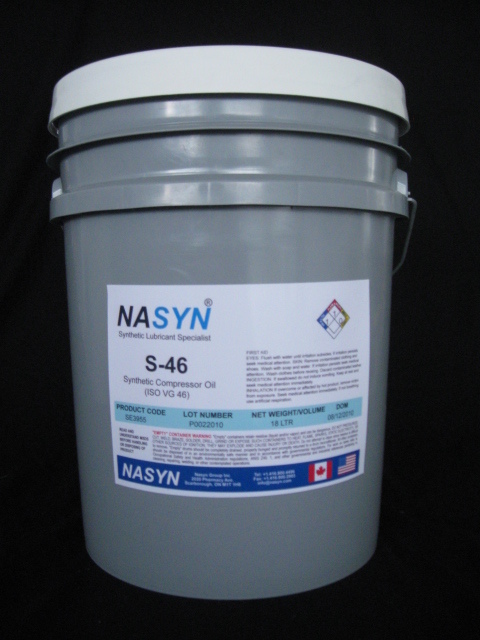 Nasyn SP series are ideal products to replace mineral compressor oils with cost-effectiveness. Service life is up to 4000 - 6000 hours under normal operating conditions. NASYN hydrocarbon based lubricants are similar to mineral Oils in their compatibility with paints, seals, gaskets and hoses. No special precautions related to compatibility are required when changing over from a mineral or hydrogen-treated oils lubricant to an NASYN Company hydrocarbon based lubricant. The ideal replacement for the OEM oils，E.g. Atlas-Copco: Roto-Inject Fluid, Roto Z, PAROIL M，Recip Oil和Roto-H Plus; Ingersoll-Rand: Pro-Tec，XL-300, XHP 405 and SL-200: Sillair: SRF 1/4000, SRF II/8000 and AWF; Gardner Denver: Aeon 500/800/2000/4000/5000; Quincy: QUIN-CIP-32/68/100 and QuinSyn IV. Fusheng: 1711-13 and 1711-RS46-20.